Procter & Gamble Co. has partnered with mobeam Inc. to bring to market a fully mobile couponing system that the partners say fixes the antiquated coupon industry without requiring any change to the existing point of sale for retailers around the world. 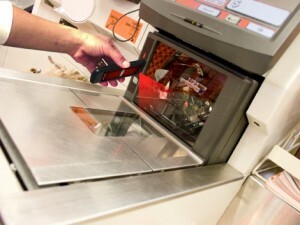 The mobeam-P&G couponing system has apparently found the way to allow the commonly used in-store laser scanners to read the barcodes displayed on mobile phone screens that were invisible with other technologies – a huge step forward and something that the partners believe will ‘reinvent couponing’. Coupons, and the way retailers are prepared to accept them, are based on UPC barcodes that are scanned by laser scanners at point of sale. However, until now, laser scanners have been unable to ‘see’ data displayed on a mobile phone screen. Further, there are more than 400 iPhone apps in the iTunes store that display UPC symbols for mobile coupons, and, from what we know, none of them could be scanned at the point of sale. That’s about to change with the P&G-mobeam launch today. The partners claim that it’s the ‘first-ever’ fully mobile couponing system – and it does seem that this technology is a step forward that could rock the sector. Mobile couponing has been around for quite a while now. P&G rival Unilever tried mobile couponing back in 2009, and at that time, critics said that the system had potential for entry errors, slowness at the cashier level if codes had to be manually entered, and – especially – since ‘there was lack of technical equipment in many stores for swiping the codes’. We’ve written many article before and since that time re the growing use of mobile couponing. JiWire and Millennial Media, among others, have included lots of information about mobile couponing in their various reports and the Mobile Marketing Association even recently published its Mobile Couponing Guidelines. Today, couponing represents a growing $3.7 billion segment of the consumer packaged goods market in North America, with more than 300 billion coupons distributed every year and redemption on the increase as consumers strive for greater value and savings. 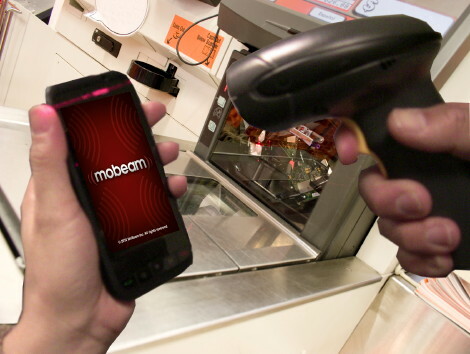 The new innovation, created by San Francisco-based mobeam, makes electronic coupons presented on a phone or other mobile device scan-able, so shoppers need only their phones/handhelds at check out. While smartphones are supporting users and simplifying life in a host of new ways, until now, phone couponing was difficult because barcodes displayed on mobile phone screens have been invisible to the commonly used in-store laser scanners. Mobeam technology converts – or mobeams – the barcode data into a beam of light that can be read by barcode scanners already found at store checkout counters. No additional point-of-sale equipment is needed. P&G, one of the world’s leading coupon distributors, developed its partnership with mobeam through P&G’s open innovation Connect+Develop program, designed to bring leading innovation into P&G and share P&G innovation with others. The P&G and mobeam partnership is aimed at exploring and testing a new, highly efficient method for consumers to redeem – and retailers to accept – coupons at the point of sale. “Our vision with P&G is for the mobeam technology to be used and leveraged broadly by many leading CPG companies, with P&G and other key consumer goods partners as first adopters,” says Christopher Sellers, mobeam CEO. The next step in the partnership is to work with leading phone companies to add the mobeam application into handheld phones and then to test the application and process with shoppers and selected retailers. The service aims to enable North American retailers to accelerate adoption of mobile coupons without hardware changes at POS. Because coupons will be submitted digitally, mobile coupons would increase efficiency and reduce costs. Digital coupons provide substantially deeper analytic capabilities, allowing better measurement of campaign effectiveness, as well as efficiencies in distribution, purchase validation and processing. Mobeam is currently working with handset manufacturers to engineer its light-based communications technology into new lines of handsets. P&G, mobeam and other partners expect to test the technology in market in 2012. Mobeam is also in talks with other consumer packaged goods companies to deploy similar programs as that with P&G. This entry was posted on Monday, December 19th, 2011 at 14:00 @625 and is filed under DailyDOOH Update. You can follow any responses to this entry through the RSS 2.0 feed. You can leave a response, or trackback from your own site.